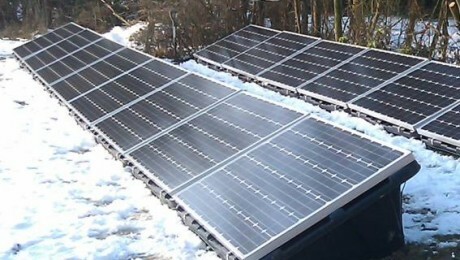 How to Maximise the Efficiency of PV Panels: Should they Face South or West? Despite what the Telegraph’s headlines suggest, south-facing solar panels generate more power than those facing west. But why are sections of the media and a small group of scientists rooting for west-facing panels? 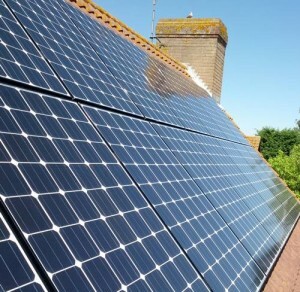 Telegraph managing editor Keith Perry says that according to energy experts, “thousands of people have spent vast sums of money installing eco-friendly solar panels but most will have probably had them fitted facing the wrong way.” As is often the case, probably is the key word here. Turns out that south-facing solar panels actually generate more electricity than west-facing solar panels, and whilst Perry probably knows this, his headline suggesting that the opposite is true is much more newsworthy, though also a little misleading. The whole west is better than south argument first made waves back in November 2013 when a report from the Pecan Street Institute found that west-facing solar panels generated more electricity than south-facing solar panels for twenty four houses in Austin, Texas, but only over a three-month period. The same report concludes that over the course of a year south-facing solar panels provide “more total energy than other orientations.” Question marks have since been raised as to the report’s validity due to small sample size. What’s the Argument for West? The same situation is occurring in Cornwall. Many people have built solar panels in the sunny Southwest and the grid is unable to handle any more energy. As such, they’ve had to reconsider construction for the time being. So whilst the individual homeowner gains more power from a south-facing solar panel, in places that already have a lot of solar panels it’s better for the grid to build east-facing or west-facing solar panels. It’s also worth considering that west-facing solar panels generate most of their energy in the afternoon, which is when demand for electricity generally peaks. The government’s current feed-in-tariffs (FIT) pay out to homeowners based on the amount of electricity that they generate for the grid, with a typical system in the South of England generating an income of £330 plus savings annually. A homeowner with a south-facing panel will earn more through FIT than a homeowner with a west-facing panel. Unless the government changes the incentive system to reward west-facing solar panels, it’s unlikely that very many homeowners will opt for a less efficient, less financially rewarding placement of their solar panel. What else to Watch out for? Make sure that there are no shadows on your panels. Make sure that there isn’t a layer of dust on your panels. Keep your panels at the right temperature. Although FITs are a nice source of income, it makes more financial sense to try and use the electricity that you generate, rather than sell it to the grid. If you have a south-facing grid, set your appliances to go to work at midday when you have plenty of solar energy available. Of course, the most efficient way to use you PV panel is to get a fully automated solar tracking mount. This kind of mount follows the sun as it moves through the sky, so your panel is always facing the best possible angle. However, these kind of rigs can be expensive, so until the price comes down your best bet is probably sticking with a south-facing panel! Are you interested to know how much money you could save with renewable energy? You can either keep reading our blog, or speak to a member of the team at 01621 827015. Posted on September 15, 2014 by Clive Rolison	in Renewable Energy Blog. Tags: solar panels. How Much Can You Save with Renewable Energy? We all know that renewable energy is good for the environment, but did you know that it can be good for your wallet too? Not only will you save on energy bills, but a range of incentives means that homeowners are paid by the government for renewable energy produced on their property or for investing in renewable energy heating systems. Want to find out how much you can earn? Read our blog to find out more. A supplier will pay you for electricity generated by solar panels on your home – even if you choose to use all of it yourself! 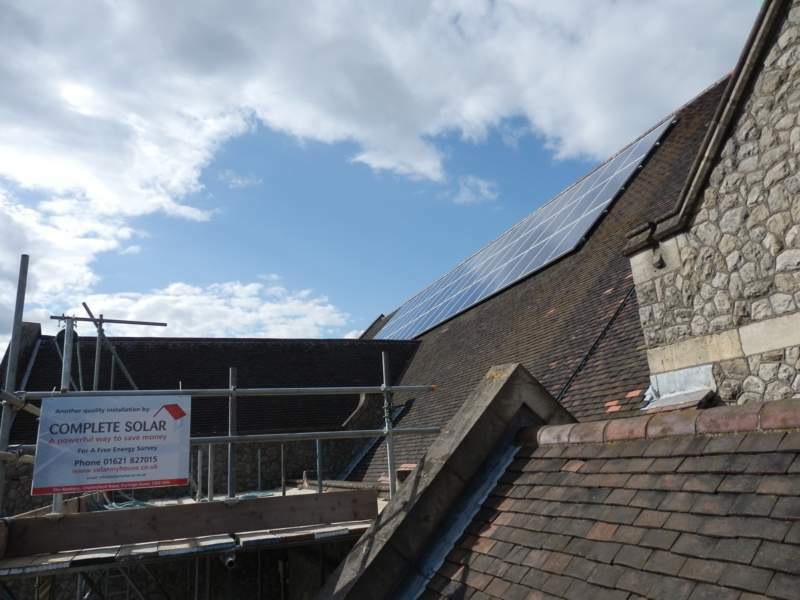 The going rate for approved solar panels, and at Complete Renewables we are always happy to check eligibility, is 14.9p per kilowatt-hour, which averages out to £540 per year on a typical system, according to Money Saving Expert. Nice! Just when you thought it couldn’t get any better, there’s a bonus 4.6p for every kilowatt-hour that you don’t use – or ‘export’ back into the grid. Under the current system, most energy suppliers don’t bother to fit you with an export/import meter to calculate exactly how much you export back into the grid. Instead they assume that you export 50% of the energy your solar panels produce – meaning additional bonus savings of £90 per year on average, even if you use all the energy for yourself. It’s no secret that energy bills are predicted to rise massively over the next twenty years, as we continue to rely on ever-dwindling stocks of fossil fuels. However, this means that for those who invest in solar panels, savings will rise massively too! The Energy Saving Trust estimates that the current rate of saving for a typical family is £125 per year – good now, and it’s only going to get better. 4. Complete Renewables’s Summer Sale! We are currently offering PV Solar Panels for under £6,000 to some customers in our summer sale, meaning that now is a great time to invest in solar panels. Our typical 4 Kilowatt system will earn you a profit of £1,600 in your first ten years, and an incredible £7,600 in the second ten years! This represents a healthy 14% investment, which is good for both the planet and for your finances. The savings and incentives don’t end with solar panels. The Renewable Heat Incentive (RHI) is the world’s first long-term financial support programme for renewable heat. The government will pay you between £600 and a massive £2,300 to invest in a renewable heat source, including solar heating system and ground source pumps. you are a household of two, no need to panic, we can fit you with just one solar thermal panel, which provides you with free solar heated water for 70% of your hot water needs. Interested in Saving Money and the Planet Yet? How often do you get a chance to both make money and help the planet both at the same time? Renewable energy is a win-win move, so contact Complete Renewables today and see how much you could save! Posted on July 3, 2014 by Clive Rolison	in Renewable Energy Blog. Tags: ground source pumps, renewable energy, solar panels. The world is dependent on fossil fuels for it’s energy supply. Currently, fossil fuels account for 80% of the world’s energy consumption. However, fossil fuels take millions of years to form and our reserves are depleting rapidly. This means that fossil fuels are non-renewable resources and society needs to find an alternative energy supply. Renewable energy is energy which comes from a natural source and is not depleted when used. Renewable energies include wind, wave and solar power. In the UK, we have copious amounts of wind and waves, and a little bit of sunshine, available to us. Why not make the most of that? The UK is currently making good progress with more people wanting to install solar panels on their roofs and wind farms being set up around the country. There are many reasons for society to switch to renewable forms of energy. Fossil fuels are running out fast. Unfortunately, the world’s infrastructure is reliant on fossil fuels. They power electricity plants, heat our homes and provide fuel for our cars. Eventually, fossil fuels will run out entirely or become too expensive for people to afford. But you can’t change energy resources overnight! Switching to renewable energy takes time. Research shows that burning fossil fuels contributes to climate change, often referred to as ‘global warming.’ Though there is still more research to be done, we know that releasing so much carbon dioxide into the earth’s atmosphere is causing severe weather problems. These include melting polar ice caps, wildfires in the USA and heat waves across Europe and in India. Fossil fuels not only cause climate change, but are also damaging the environment through land, water and air pollution. An example of this is air pollution caused by burning coal. Burning coal releases fine particles that can cause respiratory health problems if they are inhaled. These pollutants become part of the water cycle and create acid rain, which pollutes water, ruins land and corrodes buildings. Arguably, renewable energy sources also affect the environment. For instance, wind turbines can impact migrating birds and dams can disrupt ecology of surrounding areas. However, the negative impacts are far less than those of fossil fuels and renewable energy is undoubtedly better for the environment overall. Renewable energy not only makes environmental sense, but also economic sense. By switching 70% of the planet’s electricity production to renewable alternatives, Greenpeace estimates the world’s economy would save $180 billion per year. The renewable energy industry is increasing employment opportunities worldwide and is gaining a lot of investment. In Germany, renewable energy accounts for a quarter of the nation’s energy consumption. As a result, renewable energy industries have created 380,000 new jobs. In the USA, solar power workers currently outnumber coal miners. Currently, people are no control of their energy supply. They can chose which company to purchase their electricity from, but they have no means of creating their own energy supply. With renewable energy systems, people can have complete control. The average person is able to buy their own solar thermal panels or an air source heat pump for their own home. Being in complete control of your energy means that you are not affected by changes in price or shortages from electricity or gas companies. 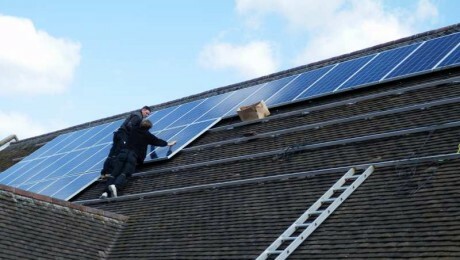 In fact, installing solar panels can shave £223 off your annual electricity bill. With renewable energy, you can be entirely self-sufficient. Renewable energy is the only way forward. There are many benefits of switching to renewable sources, primarily the fact that non-renewable energy sources will run out and there won’t be any other option. Renewable energy will never run out, and will therefore be able to supply our children and their children with the energy they need. Posted on June 2, 2014 by Clive Rolison	in Renewable Energy Blog. Tags: renewable energy, solar panels. 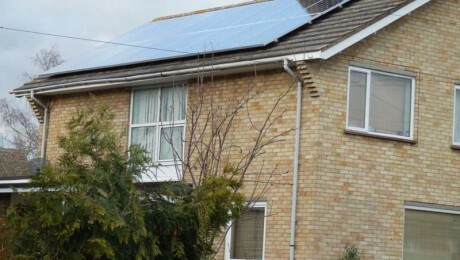 Why are solar panels not a more popular option for home owners? 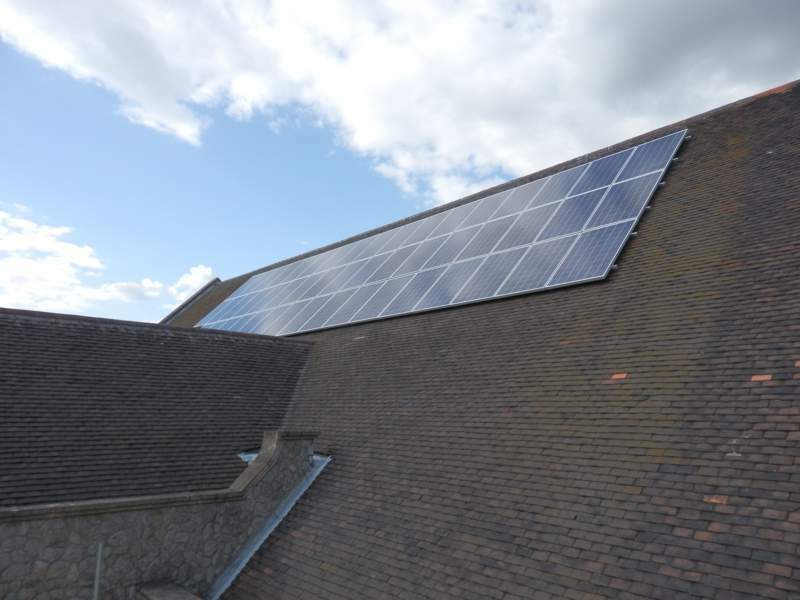 On the other hand solar panel installations have never been cheaper; Complete Renewables are now offering 16 panel 4kW arrays starting at under £6,000. The Feed-In tariff is still providing government back payments, leading to returns of over 12%. There’s also technological innovations such as Solar Cache, which allows homeowners to divert unused electricity generated during the day to heat their hot water. This can represent significant saving, especially for families who are mostly not at home during the day. When solar is combined with other renewable technologies, there is yet more potential to save both money and energy. For example many of our customers who choose to install ground or air source heat pumps also install solar. With this list of benefits, why doesn’t every roof have a panel array? Well there’s the obvious reasons; lack of funds, rental properties, short-term occupancy. However this only discounts a minority of homes. One explanation we hear often is that homeowners believe they have ‘missed the boat’, that the Feed-In tariff used to a great deal, now it is hardly worth it. It is true that the Feed-In tariff was once more generous, however it still does still represent a quantifiably strong investment. Returns average around 12%, there are very few alternative options with these kind of guaranteed returns. The bank certainly won’t match those figures. How about the lack of understanding that seems to shroud the industry? There has always been a stigma associated with renewable energies. The same scepticism that wind and wave generated power suffer from. Even heat pumps suffer this: ‘How can heat pumps possibly work in cold weather?’ is a question we hear often. The general public can often be reluctant to believe that a new technology which harnesses solar power (even indirectly, such as wind and heat pumps) can create the necessary power, in the way fossil fuels can. This is, of course, despite the fact that fossil fuels originate their energy from the sun themselves – organic compounds, etc. It’s not that renewable technologies are any more complicated. Maybe it’s that mostly we’ve all lived through their infancy and development. We’ve heard the anecdotes about wind turbines that cost more in energy to construct than they’ll generate in their lifespan. Although maybe this points to another issue; a generally unenthusiastic media – when did you last read a positive story about renewable energy in the press? Maybe it’s just easier and more appealing to note the negative story. Let’s face it, our media is more interested in what’s going wrong than what’s going right. Posted on May 1, 2013 by Clive Rolison	in Renewable Energy Blog. Tags: air source heat pumps, cost of solar panels, ground source heat pumps, solar cache, solar panels, solar panels essex, solar thermal. 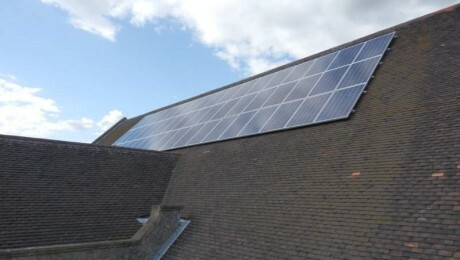 Solar panel installations have been one of our most popular products since the advent of the feed-in tariff. And within Essex we are one of the most experienced installers operating. Solar PV is still proving extremely popular. Despite the reduction of the feed-in tariff, a good installation can represent a 12% return on investment, far more than savings accounts. Furthermore recent developments such as immersion controller units (which heat your water when the sun shines) increase potential energy savings. 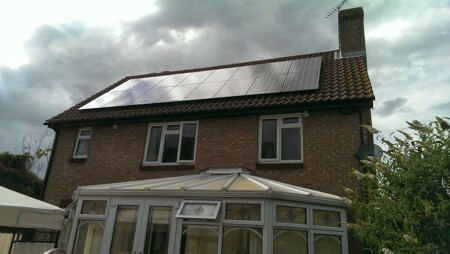 The interesting thing about the solar installation on our eco house is that the panels are fitted into the tiles. This allows a closer mount to the roof itself. Behind the panels the roof is not tiled, instead the panels fit into a tray mounted on the rafters. This allows for the requisite airflow (to aid cooling) whilst providing for a close fit to the roof itself. The advantage of this is purely aesthetic, there are no performance gains. 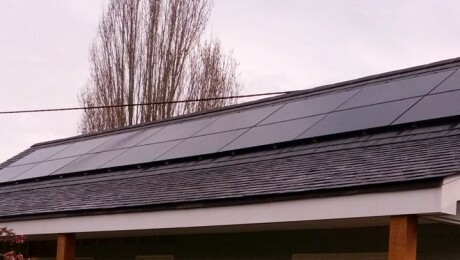 This set-up is popular with new builds which have been designed with solar in mind, which is increasingly becoming the case. It is less popular with existing roofs, i.e. retrofits. Due to the extensive amount of work that has to be carried out to an existing roof to fit the trays, it is more often than not cost prohibitive. As the attached photo shows, flush black panels set against a slate roof creates a handsome look. On a related note I do believe that peoples attitudes to the attractiveness of roof mounted solar panels are changing. Initially they were considered something of an aberration on an otherwise perfectly nondescript roof (lets face it, most roofs are wholly unexciting). However as they have become more prolific, not only have they gained acceptance, but they also create a feature. When installed thoughtful, i.e. not disrupting the natural symmetry of a roof, they provide a focus point for attention. They reveal a forward thinking home owner, someone interested in make steps towards protecting the environment and themselves from rising energy bills. Posted on April 28, 2013 by Clive Rolison	in Renewable Energy Blog. 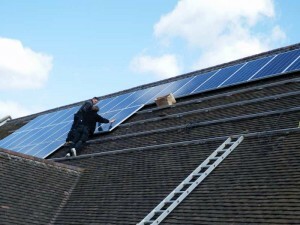 Tags: solar panel installers, solar panels, solar panels attractiveness, solar panels essex, solar panels slate roof.